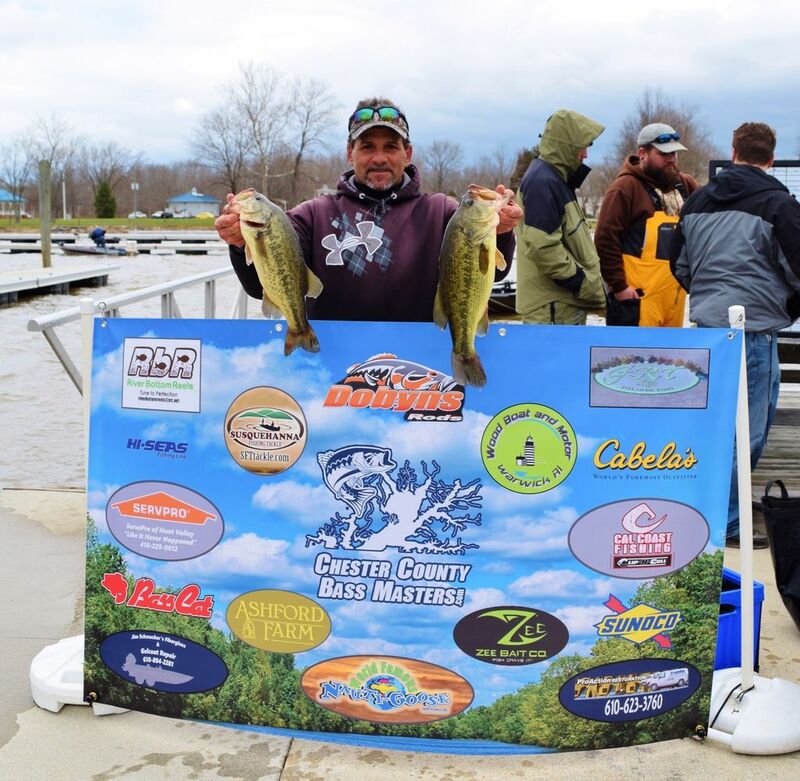 Chester County Bass Masters held their first of five opens for the 2017 season on April 1st out of Anchor Marine in Northeast Maryland. 32 Teams showed up on a cold, damp early spring Saturday to search for some of the Upper Bay’s largemouth coming out of their winter haunts. Friday into Friday night saw 3 inches of rain dumped in the area creating flooding on the Northeast creek and River with heavy runoffs carrying a lot of mud and small surface debris into the water. Air temps at launch were around 43 with variable winds. The tournament launched at 7:15 under heavy cloud cover with a forecast high of 50. Winds picked up mid morning to a steady 15 - 20 gusting to 30. Water temps were in the 47 to 50-degree range depending on where you fished. Water in the Northeast was very muddy and not much better out on the Flats and Susky. Launch was on a falling tide with low around 8:00. 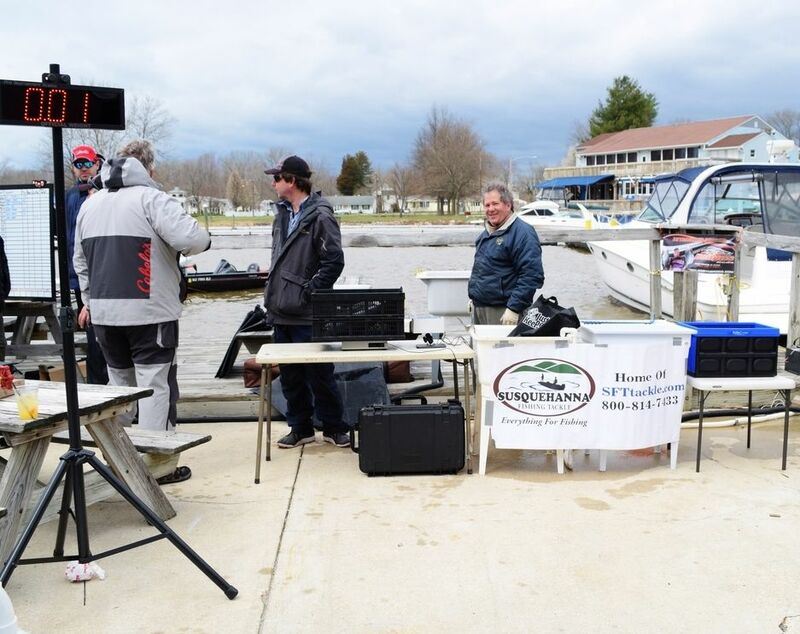 The post front muddy water conditions made fishing tough with only a handful of teams able to connect with more than 1 bass. 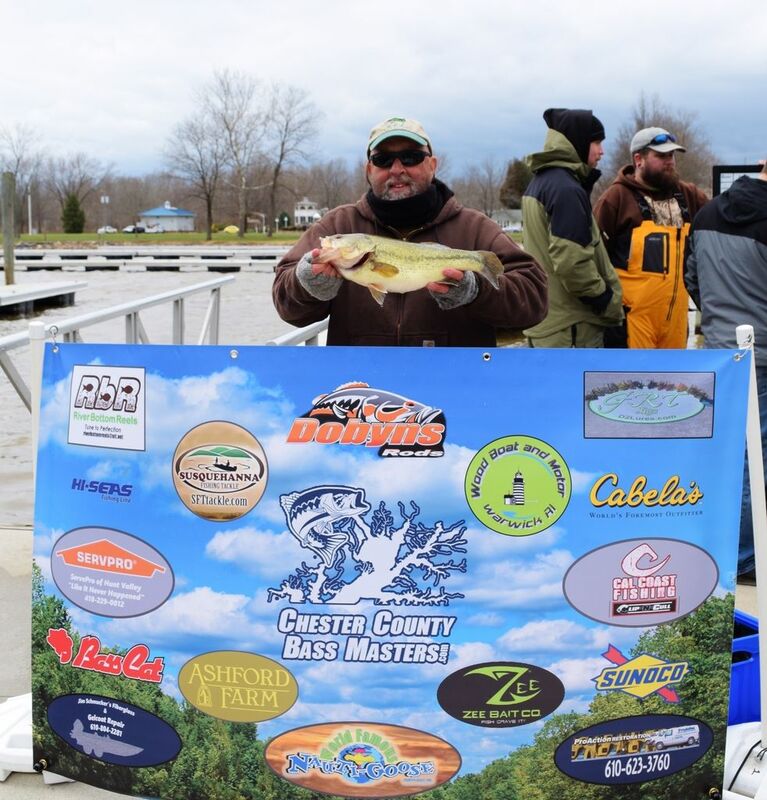 No limits were brought in for the 2:30 weigh in and only 12 of the 32 teams brought fish to the scales making it the quickest weigh in since Chester County has been running their Opens. Two bass over 5 pounds and four over 4 pounds were brought to the scale. 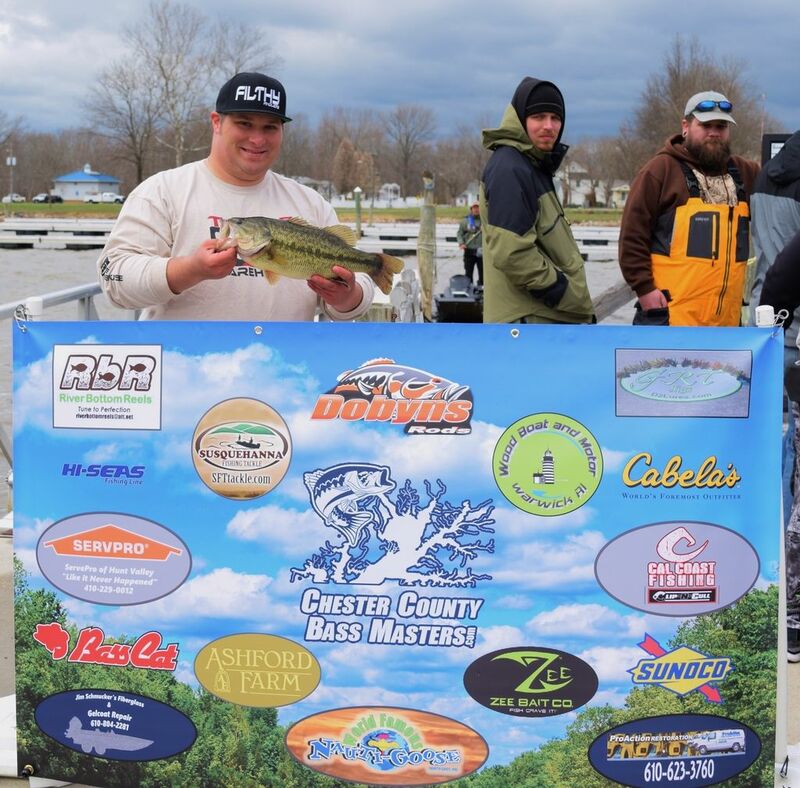 7 cash places were paid, along with 8 sponsor prizes from Susquehanna Tackle, River Bottom Reels, Cabela's of Christiana Mall, Nauti Goose Restaurant, Sunoco, Hi Seas fishing line, Zee Bait Company and Dobyns Rods . 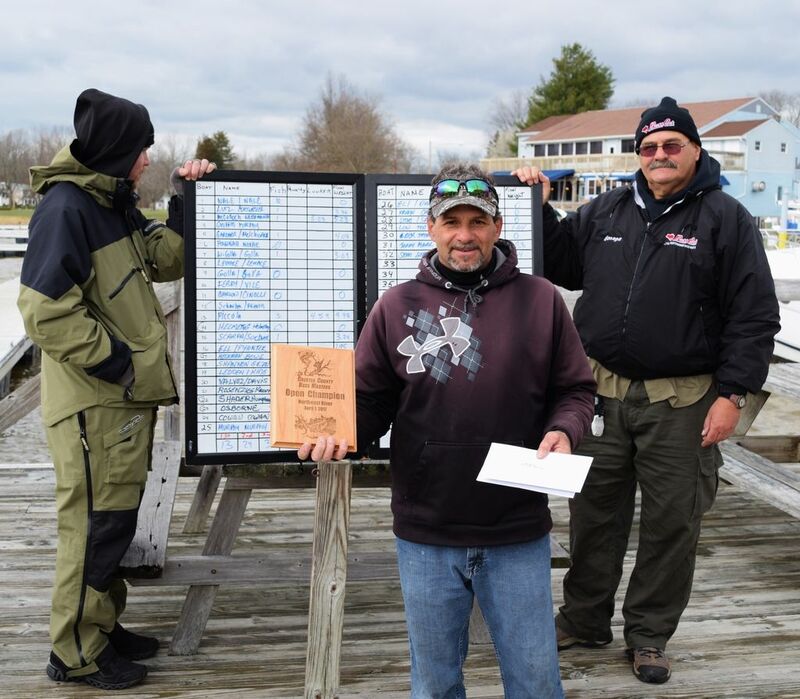 First place payout went to Mike Piccolo fishing Solo. Mike outdistanced the rest of the field with a 3 fish bag of 9.98 pounds. Included in his bag was a healthy 4.59 fat girl helping him to the win by 1.5 pounds. 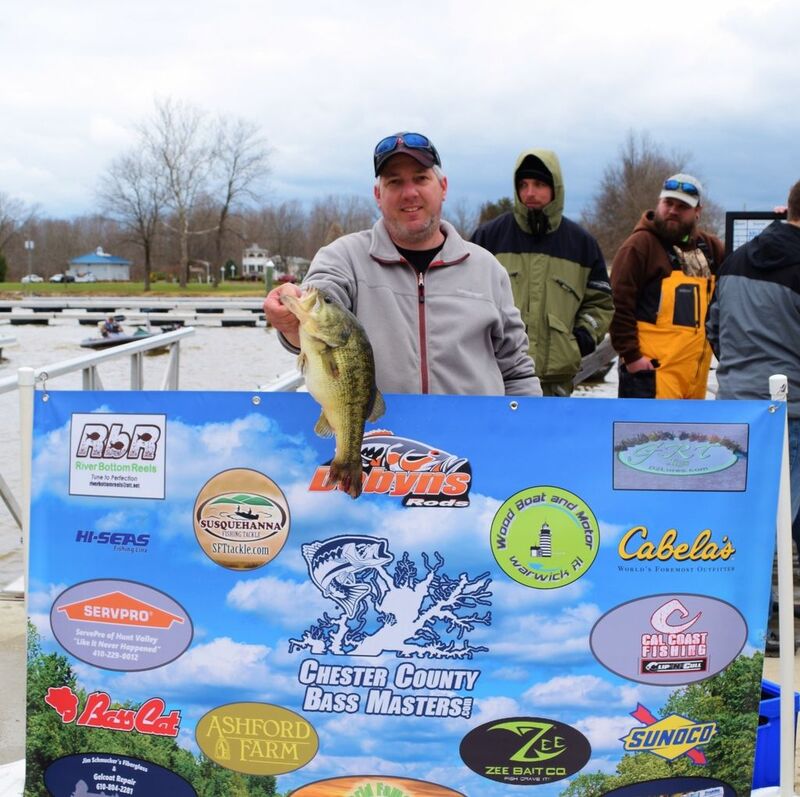 Mike won a nice pile of cash, a CCBM Open Champ plaque and a Dobyns rod discount card. Congrats on the win under really tough conditions. Second place cash went to the team of Keith and Zach Cowan who brought in 2 fish weighing 8.34 Lbs. Team Cowan also had the Tournament Lunker, a giant Upper Bay bass at 6.42 pounds winning them the $ 320 lunker money along with the second place cash and a pair of Dobyns Rods discount cards making for a good days payout. Nice work on a tenacious day. 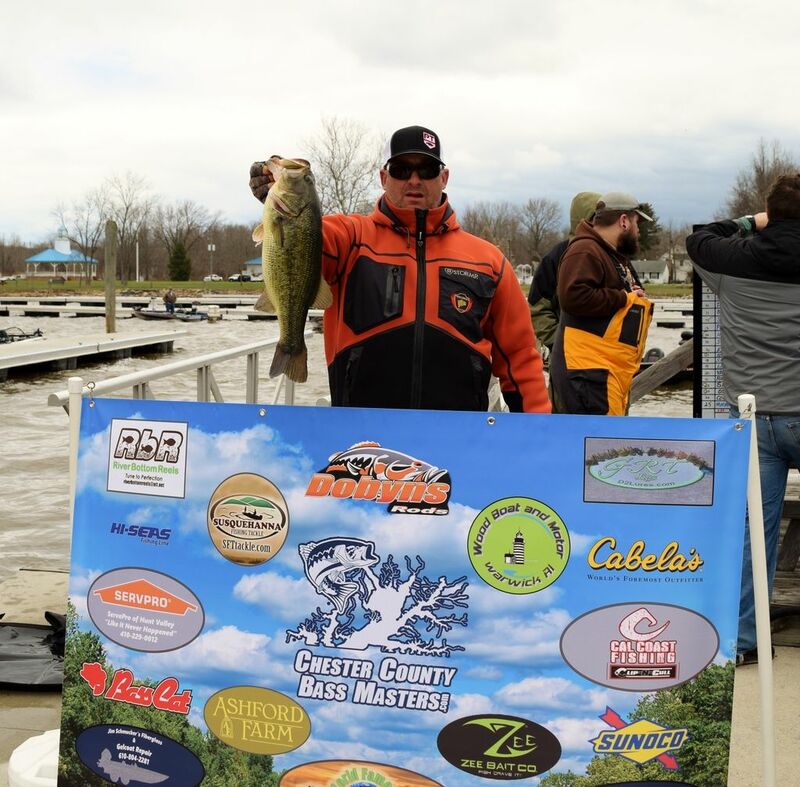 Third place money was won by the team of Dave McCulloch and Herb Weichmann who brought 1 bass to the scale, but it was the right one, a 5.23 beauty. The team also took second lunker honors and the $ 50 Susquehanna Fishing Tackle gift card that goes with it. Fourth place dough was earned by the team of Jerry Gerlach and Mark Ely who weighed in 2 fish for 4.88 Lbs. Fifth place coin went to the team of Sean Geerlof and Stan Horne with one fish for 4.69 Lbs. Sixth place cash was collected by the team of Michael Shannon and Raymond Gezzi who brought 1 fish to the scale for 4.20 Lbs. The seventh and last money spot was won by Ed Gardner and Bryce Melchior with one solid fish weighing 4.08 pounds. Eighth place and the first team out of the money won the $ 50.00 Cabela's Christiana Mall gift card. 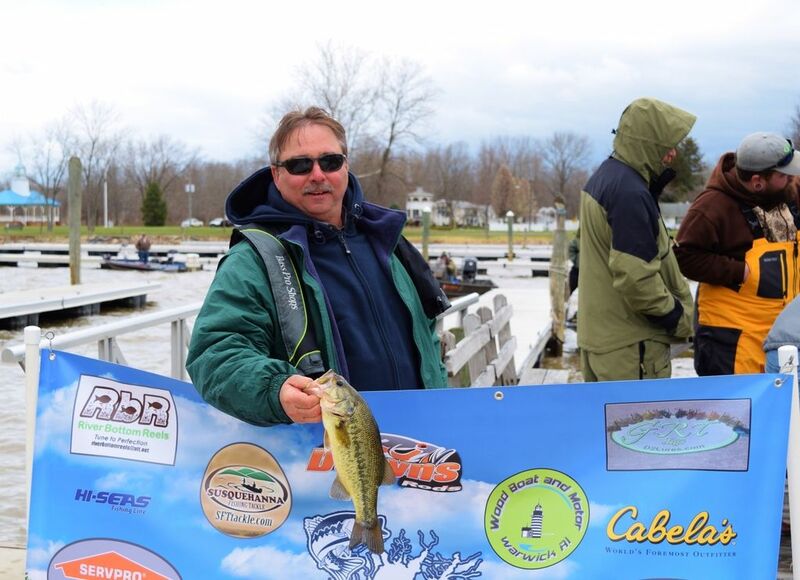 Ronald Lutz and John Detwiler weighed in 1 bass for 3.76 lbs. 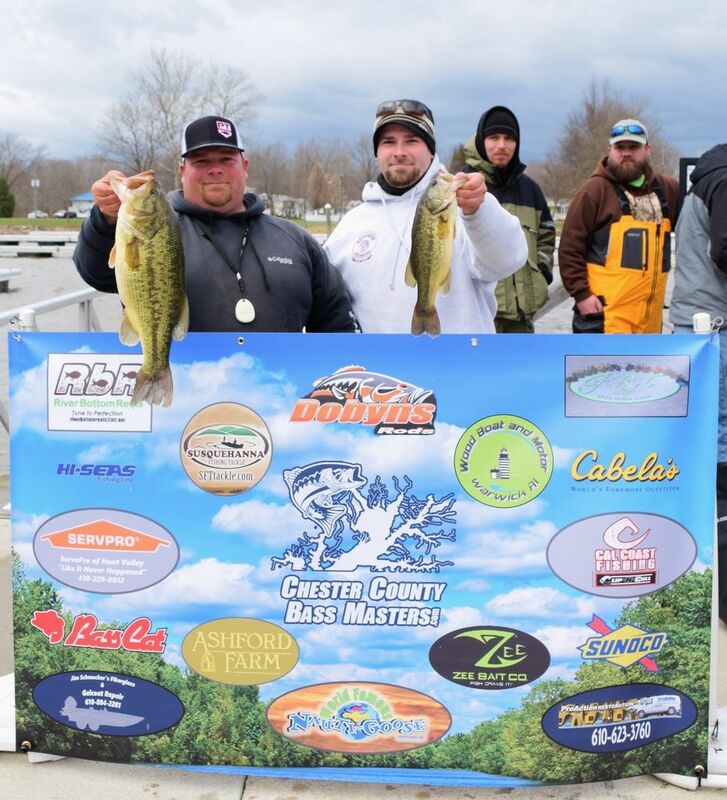 Ninth place won the $ 50.00 Zee Bait Company gift card, Wayne and Ryan Golla brought in 1 bass for 3.69 lbs. 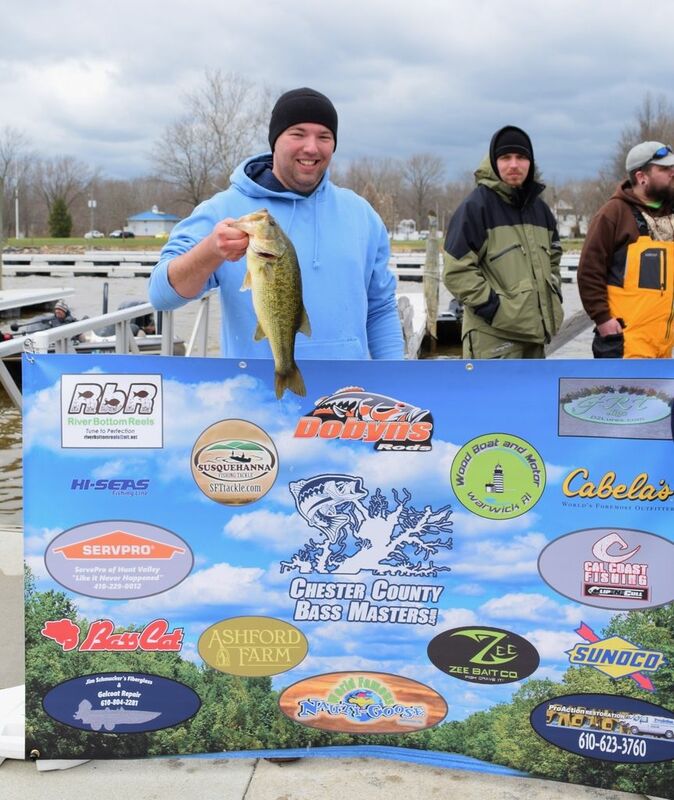 Tenth place won a $ 50.00 River Bottom Reels gift card, Drew Scarpa and Lee Sockwell brought in 1 bass for 3.29 Lbs. 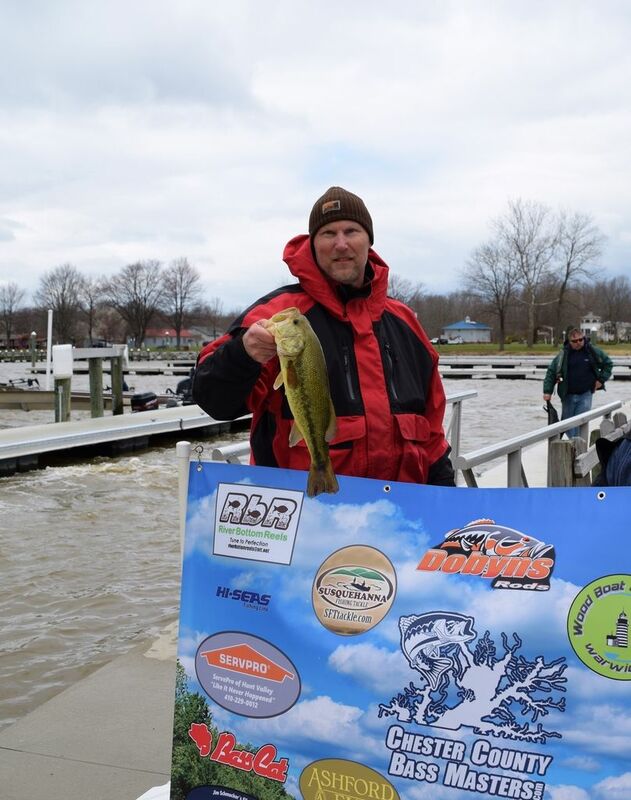 Eleventh place and a $ 50.00 Nauti Goose Restaurant gift card gift card went to the team of Layne Ell and Marc Pyantek weighing 1 bass for 1.95 Lbs. Twelfth spot won a Hi Seas Line Assortment pack which went to Lou Croce and Ted Natale with last fish weighed in at 1.64 lbs. Total cash payout was $ 2,624 along with $ 500 in sponsor prizes. The next Chester County open will be on Saturday, June 10th out of Anchor Marine. 2 - Cowan / Cowan - 2 fish - 8.34 lbs. - Tournament Lunker - .6.42 lbs. 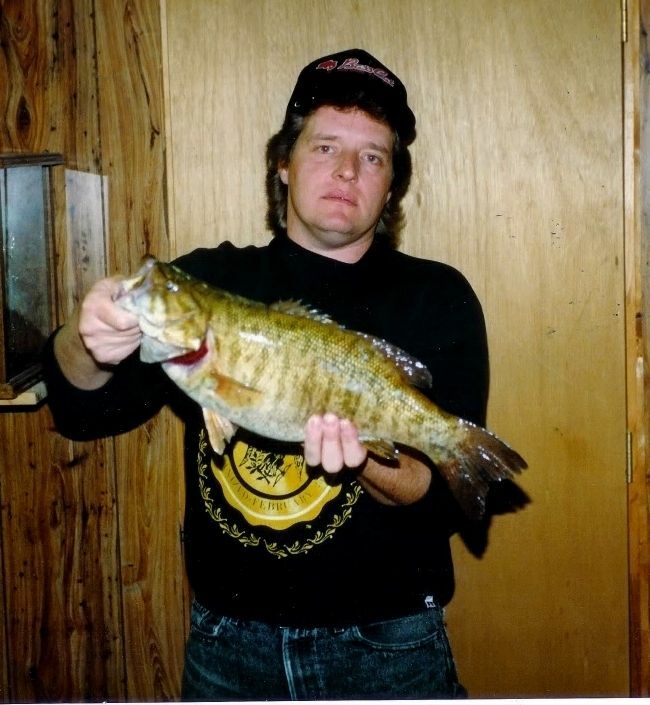 4 - Gerlach / Ely - 2 fish - 4.88 lbs. 5 - Geerlof / Horne - 1 fish - 4.69 lbs. 6 - Shannon / Gezzi - 1 fish - 4.20 lbs. 7 - Gardner / Melchior - 1 fish - 4.08 lbs. 8 - Lutz / Detwiler - 1 fish - 3.76 lbs. 9 - W. Golla / R. Golla - 1 fish - 3.69 lbs. 10 - Scarpa / Sockwell 1 fish - 3.29 lbs. 11 - Ell / Pyantek - 1 fish - 1.95 lbs. 12 - Croce / Natale - 1 fish - 1.64 lbs.